Is It Safe for Aging Adults to Have Plastic Surgery? Many of the most popular cosmetic procedures are designed to combat the common signs of aging. It makes sense some seniors receiving at-home care in Harrisburg will eventually consider the benefits of going under the knife. 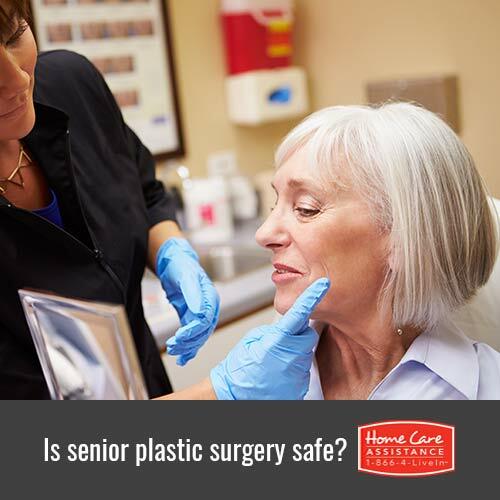 If your aging loved one is planning to receive a cosmetic treatment, you may be concerned about his or her safety. Following are several considerations elderly individuals and their family members should make before scheduling an optional plastic surgery procedure. There are a number of cosmetic treatments that do not involve any tissue removal, skin grafting, or cutting. These noninvasive procedures typically entail the use of injectable filler materials for plumping the skin and filling out wrinkles. There are even purified toxins that can temporarily immobilize the muscles responsible for facial creases so the visage takes on a smooth and youthful appearance. Treatments like these can be completed in mere minutes and generally involve far less risk than procedures that require multiple incisions, the insert of implants, and sutures. Reputable surgeons have their own professional reputations to consider and, thus, most won’t take on the risk associated with servicing seniors who are in poor general health. Before any invasive procedure is performed, your loved one needs to undergo rigorous health examinations. When the risks of excess bleeding or clotting problems exist or when prospective clients have chronic health issues, most practitioners will recommend other, less invasive alternatives. At this stage of life, seniors will usually recover from invasive procedures at a much slower pace than their younger and healthier counterparts. Because of this, invasive procedures are generally not recommended unless the individual is in good general health and believes the results of the treatment are essential for enjoying an acceptable life quality. Convincing your loved one to talk with a general practitioner before scheduling an invasive treatment is important. Seniors should only proceed with these plans after having been approved for treatment by their regular doctors. Balanced and moderate use of cosmetic procedures is generally perceived as being acceptable, especially if a senior is not facing any serious health risks during the course of these treatments. Having a major aesthetic issue resolved can positively impact a senior’s mental health. When seniors feel confident and good about themselves, they tend to become more positive and proactive in all areas of life. Thus, there are certain times when the benefits of even an invasive treatment could potentially outweigh the risks. If your loved one needs some help around the house while recovering from surgery or post-recovery, reach out to Home Care Assistance. Our caregivers can assist with a wide variety of daily tasks, including bathing, grooming, transportation, and medication reminders. For seniors who need more comprehensive care, we also offer Alzheimer’s, Parkinson’s, and post-stroke care in Harrisburg. Call one of our Care Managers at (717) 540-4663 to schedule a free in-home consultation.